The federal minimum wage for tipped positions is $2.13 per hour, and more than 20 states use that as their state minimum. So if you wait tables, deliver pizzas or caddie at a golf course, tips may be the biggest part of your income. Huge ones, like the $10,000 tip received by Pizza Hut waitress Jessica Osborne, are rare, but once in a while you probably have a customer who is extra generous. However, you can’t pay the bills every month with an occasional big tip. It’s more important to have consistently good tip income. One way to accomplish that is to work at the right place. We’ve previously covered how to find the best jobs for tips, but that’s just the first step toward boosting your tip income. Once you have the right job, it’s time to implement the next step: Increase the size and frequency of those gratuities. Michael Lynn, of the School of Hotel Administration at Cornell University, wrote a research paper reviewing 14 studies of tipping behavior. Although the studies he reviewed focused primarily on restaurant servers, the conclusions may apply to other tipped positions. We’ll go through the strategies one by one, as well as a couple of additional options. Here are 16 proven techniques for getting more tips and bigger tips. Not surprisingly, the biggest factor affecting tip size was the total size of the bill, Lynn’s research confirmed. That’s why you’ll generally make more waiting tables at an expensive restaurant than at one with lower prices. But what if you already have the job? In that case, Lynn says “the best way for servers to increase their tips is to increase their sales.” If you wait tables, encourage customers to order appetizers and desserts. If you drive a limo, sell the upgraded service. If you’re a bartender, steer customers to the highest-priced drinks. 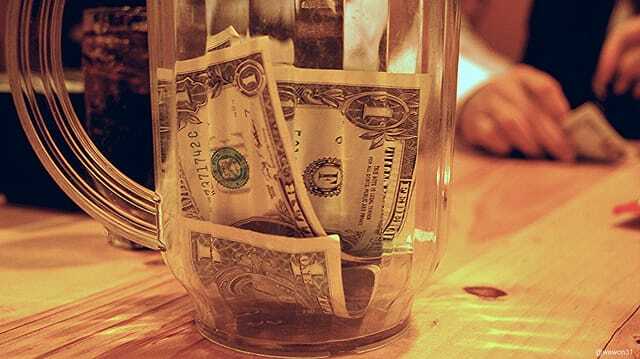 You should sell more to make bigger tips, but with one important exception. When it’s busy, you’ll make more tip income with faster customer turnover, especially in a restaurant setting. As Lynn points out, “entrées are more expensive than appetizers and desserts,” so keeping customers around for extras can mean serving fewer customers during a shift, reducing the tips you make from primary sales. Here’s the rule: If it’s busy, don’t sell extras that slow customer turnover. Otherwise, boost the bill size to boost your tip income. Your job may require a uniform, but if you’re allowed to accessorize, Lynn suggests you do so. He says you want to be seen “as an individual person rather than a faceless member of the staff.” He points to a study he reviewed in which waitresses received 17% more in tips when wearing flowers in their hair. How do you boost your average tip from 16% of the bill to 23%? In one French study, it was as simple as giving customers a card with a joke written on it. Another study in New Jersey found that giving customers a word puzzle increased tips from an average of 19% to 22%. You’ll have to decide for yourself when it’s appropriate to entertain customers, but the studies show it works for bartenders and restaurant servers. Lynn cited studies that showed a happy face or picture of the sun on the customer’s bill resulted in bigger tips. Those customers who received the note tipped an average of 22.2%, versus 18.8% for those who did not. In another study, customers who were thanked by name tipped more. Servers who returned credit cards with a “thank you, Mr. Smith” earned better tips than those who didn’t use names. At least two studies found that tips increased significantly when customers were given candy. The biggest increase came when customers were spontaneously offered a second piece. Researchers speculate that other gifts may have a similar effect. The experimental evidence reviewed by Lynn suggests that the following can also help you get bigger tips. Schafer points out that good service means something different to different customers. Some want to be left alone while others want you to check on them often. The real trick, then, is to learn to read your customers. He notes that the ability to read people is also important when implementing the tactic of touching customers. While the research shows an increase in tips from touching a customer’s hand or shoulder, this could be annoying or offensive to some. In other words, regardless of what the statistical data shows, you need to pay attention to the responses you get and provide the kind of experience each customer wants. All of the suggestions above have to do with how you interact with customers. But there are also three structural changes you can make in your work, and each is likely to add significantly to your tip income. They have to do with when you work, your position and the kind of customers you typically have. When delivering pizza many years ago, I made at least twice as much per hour in tips on weekend night shifts versus working on weekend afternoons. Naturally, I did what I had to do to get more work on Friday and Saturday nights. You may already know which shifts are best for tips where you work. If not, ask other employees and experiment with working at different times. If you have any say in the matter, try to work all of the best hours. When I drove an electric tram for a retirement community, I made less than a dollar per week from tips. Meanwhile, the college kids who set up chairs and umbrellas at the beach sometimes made hundreds of dollars per day in tips. Clearly, you’ll make better tips from some jobs, so identify the best position your employer offers and apply for a transfer. I first received tips as a pizza delivery driver, and quickly learned to grab orders going to good tippers. I avoided deliveries destined for the one we called “Fang.” The stench of his home hit you when you opened your car door, the dirt on his unwashed hands had creases, and he hadn’t cut his fingernails in a year. But the worst part for us minimum-wage drivers was that we got a tip of just 35 cents every time, no matter how fast the service or friendly the approach. You can’t always choose your customers or avoid the worst ones, but do what you can. For example, some pubs have several different bars, and the customers who tip big may tend to congregate at one or the other. If you work as a massage therapist, tour guide or in any position where the customers can choose you on their next visits, provide the best service possible to the big tippers (and only to them if you want to be truly mercenary). If you build a better clientele, you’ll increase your tip income dramatically. Your Turn: Have you ever worked for tips? What did you do to increase the size and/or frequency of your tips?